Early Christians observed "a season of penitence and fasting" in preparation for the Paschal feast, or Pascha (BCP, pp. 264-265). The season now known as Lent (from an Old English word meaning "spring," the time of lengthening days) has a long history. Originally, in places where Pascha was celebrated on a Sunday, the Paschal feast followed a fast of up to two days. In the third century this fast was lengthened to six days. Eventually this fast became attached to, or overlapped, another fast of forty days, in imitation of Christ's fasting in the wilderness. The forty-day fast was especially important for converts to the faith who were preparing for baptism, and for those guilty of notorious sins who were being restored to the Christian assembly. In the western church the forty days of Lent extend from Ash Wednesday through Holy Saturday, omitting Sundays. The last three days of Lent are the sacred Triduum of Maundy Thursday, Good Friday, and Holy Saturday. Today Lent has reacquired its significance as the final preparation of adult candidates for baptism. Joining with them, all Christians are invited "to the observance of a holy Lent, by self-examination and repentance; by prayer, fasting, and self-denial; and by reading and meditating on God's holy Word" (BCP, p. 265). Evening Prayer, Soup Suppers, and Study are on: 3/8, 3/15, 3/22, 3/29, 4/5, 4/12. Feed your body and your spirit this Lenten season with our Friday evening Soup Supper and Book Study. We begin our evening with Prayer at 5:30 in the Choir followed by a light soup supper and Lenten study in the Parish Hall. We will be discussing the book "Forgive and Forget, Healing then Hurts We Don't Deserve." 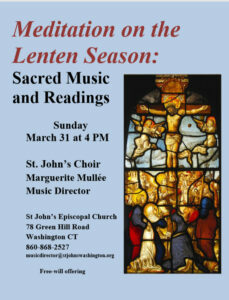 Lenten Sacred Music and Readings on Sunday, March 31 at 4 PM. The St. John's choir, conducted by Marguerite Mullee, will present a distinctive program of sacred choral music, scripture readings and poetry developed by Dr. Mullee and features music by Mozart, Morley, Tallis, Josquin Desprez, J.S, Bach, and Gibbons. In addition, there will be readings from Scripture as well as poetry featuring T.S. Eliot, Chris Price, W.H. Auden, John Donne and Wendell Berry. Reception to follow. Free will offering.